The latest Australian geoscientist employment survey results show little change in unemployment and underemployment amongst Australian geoscientists in Quarter 3 from Quarter 2, 2018. Geoscientist unemployment in Australia during the third quarter of 2018 was little changed from the previous quarter. The unemployment rate fell from 8.5% at the end of June to 8.3% at the end of September. Under-employment amongst self employed geoscientists also fell slightly, from 13.2% to 12.9% for the same period. 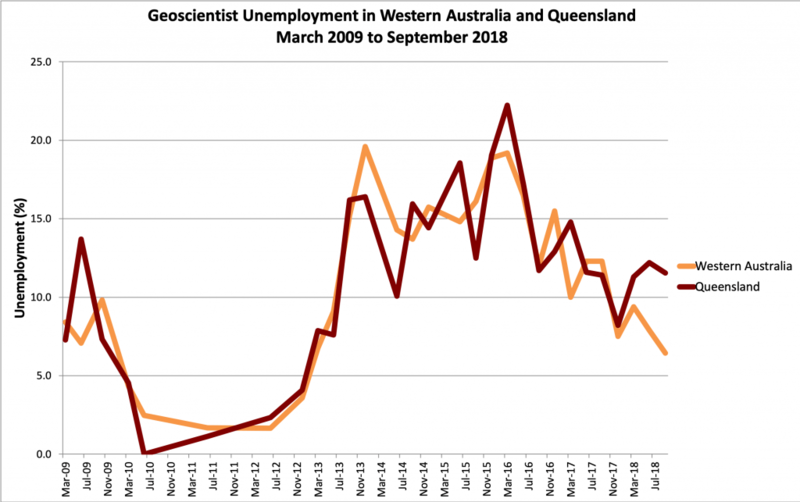 Geoscientist unemployment in Australia June 2009 to September 2018. 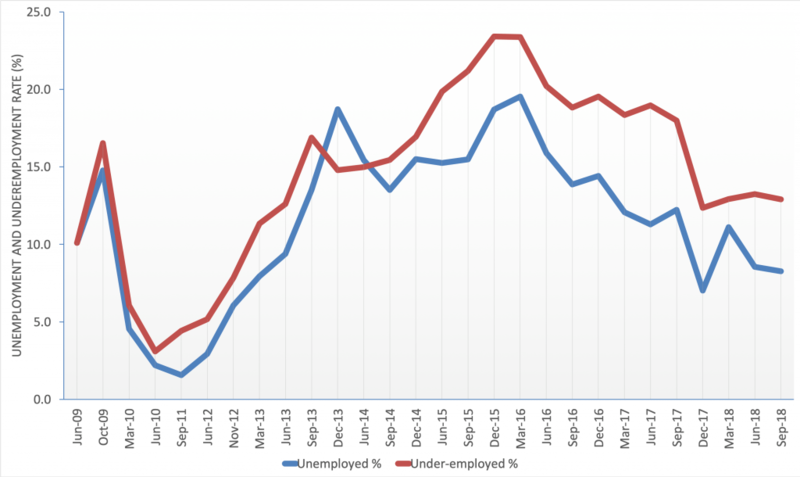 Almost half (43%) of respondents reporting that they were under-employed said that they were achieving less than 25% of their desired level of self- employment, pointing to real unemployment and under-employment rates of 13.8% and 7.4% for the September quarter of 2018 respectively. The survey results are interpreted to reflect anecdotal evidence of continued improvement in geoscientist employment in Australia throughout 2018, but the pace of improvement has been slow. “Employment conditions for geoscientists in Australia are showing very welcome, gradual employment but the rate at which this improvement is happening remains slow” AIG spokesperson Andrew Waltho said. State by state, unemployment fell in Western Australia and Queensland. A small increase in unemployment was observed in NSW and the ACT, but significant increases in unemployment were evident in Victoria, where unemployment increased by almost 11%, followed by South Australia at over 9%. “In the latest survey, 23% of unemployed and underemployed respondents lost employment during the past three months”. “This was only slightly exceeded by the number of respondents re-entering the workforce” Mr Waltho said. “A significant number of geoscientists appear to be caught in an employment revolving door” Mr Waltho said. The proportion of geoscientists employed in mineral exploration during the September quarter increased, from 65.3% to 66.1% during the quarter; the highest contribution proportion of survey respondents engaged in mineral exploration of 66.9% recorded by these surveys in September 2012, suggesting that increased mineral exploration in Australia is making a difference, but at the expense of other fields of practice. Little change was evident in employment in metalliferous mining and energy resource exploration and production. The proportion of unemployed and underemployed geoscientists looking to leave their profession fell sharply from 4,2% at the end of June, to 2.6% at the end of September. “The decline in geoscientists looking to leave their profession must be seen as a positive sign” Mr Waltho said. “These results are markedly down from the peak of 11.4% of unemployed and under-employed geoscientists looking to leave their profession recorded in December 2016” Mr Waltho said. The proportion of geoscientists in full-time employment in the latest survey was 68.6%, well below the peak of 83.9% recorded in June 2014. Part time employment provided 3.3% of jobs. Some 28.1% of respondents identified as being self employed; up from 21.9% in the previous quarter and the low of 13.0% recorded in June 2013. “We have clearly seen a trend towards engagement of self-employed geoscientists as consultants and contractors by exploration and mining companies over the past four to five years” Mr Waltho said. “This is reflected in data for employment and unemployment by years of experience, which points to almost half of unemployed geoscientists being the most experienced component of the workforce” Mr Waltho said. 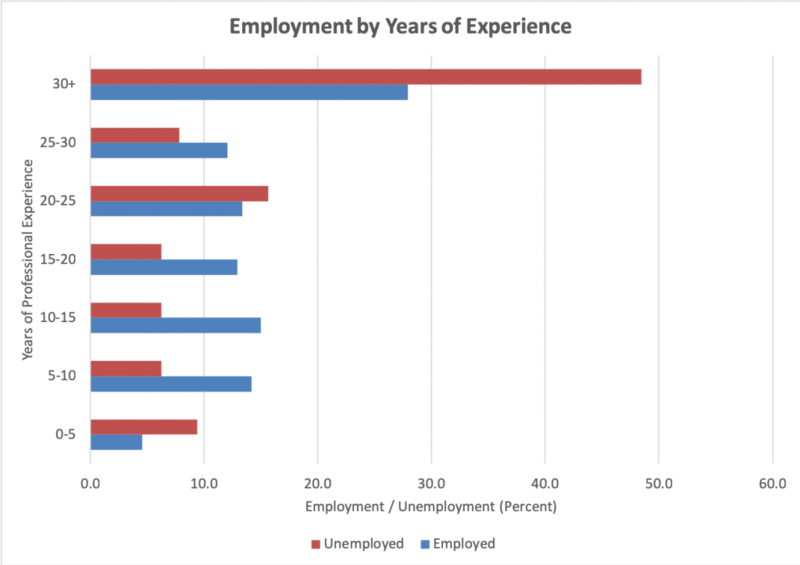 Geoscientist employment and and unemployment by years of experience. “Early career geoscientists are also experiencing difficulties getting started in the profession” Mr Waltho said. “AIG is strongly focused on this issue with AIG’s National Graduate Committee working hard to improve opportunities for early career geoscientists through initiatives that, notably, include the Institute’s extremely successful mentoring programme” Mr Waltho said. The next survey will open for contributions on 1 January 2019. These notes are provided for AIG members to foster engagement and transparency in AIG activities. They do not comprise the minutes of the meeting. Questions and comments are welcome. Please contact any Councillor (listed on the back page of each issue of AIG News or Lynn Vigar, AIG Executive Officer (exec@aig.org.au). Memberships for members who have not renewed for 2018-19 will lapse 31st December 2018. Any members who are unsure of their membership status can search their details on the AIG website. If your details do not appear, you are currently unfinancial and your membership will lapse. Please contact the secretariat office (aig@aig.org.au) or Lynn Vigar, AIG Executive Officer (exec@aig.org.au) to resolve this situation. 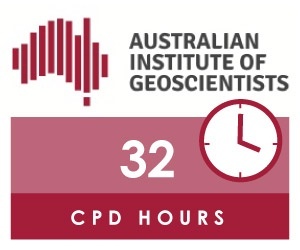 The Australian Geoscience Council Convention (AGCC 2018) held in Adelaide during October operated at a small surplus. AIG is an AGC member society and contributed to the organisation of the convention. Some 19 new applications for membership were approved. Three applications for professional registration are in preparation for consideration when Council meets in December. Council is aware that potential membership applicants, in rural and remote areas of Australia in particular, experience problems with obtaining supporters for applications. Please contact the secretariat office (aig@aig.org.au) or your state branch committee if you are in this situation. Council approved the renewal of AIG’s dedicated Edumine Campus. AIG Graduate Members, Members and Fellows subscribing to the campus have access to a suite of high quality, on-line, self-paced professional development materials and webinars at a special enrolment fee. Council is also discussing using the Edumine platform to enable self-paced courses developed for and by AIG members to be delivered to a global audience using the Edumine platform. Edumine is moving to a “micro-accreditation” model under which individual, short, courses collectively contribute to broader recognition of continued professional development activities. Council endorse this concept, in preference to single, more lengthy courses that busy professionals may struggle to complete, and for which individual models may not address professional development objectives. All Edumine courses may be claimed by Registered Professional Geoscientists towards their annual CPD requirement. Representation of individual sectors of the geoscience profession was discussed by Council in response to a Member’s letter expressing concern that geoscientists working in the public sector require better representation. Please contact the Secretariat (aig@aig.org.au) or any Councillor to participate in this discussion. AIG aims to represent all professional geoscientists working in industry, government, research and education in Australia. The next Council meetings are scheduled for Wednesday, December 12, 2018, and Wednesday, January 23, 2019. Submissions for the January 2019 meeting should be received by January 2, 2019.